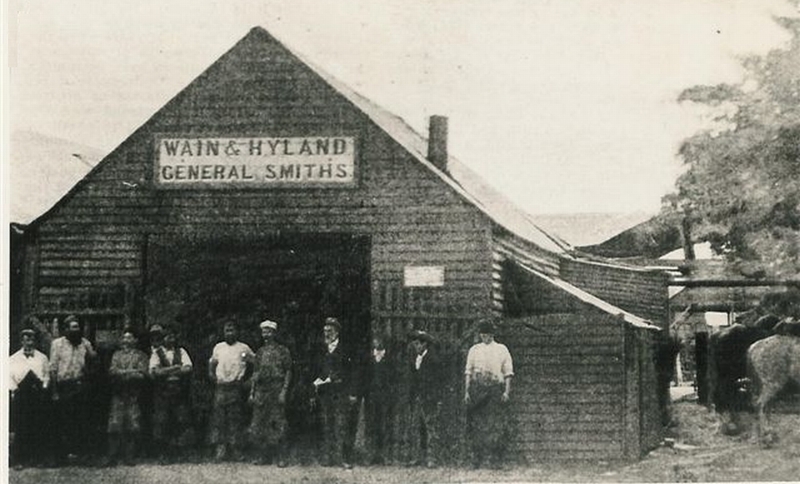 Wain & Hyland General Smiths. © Chiltern Athaeneum Museum, used with permission. 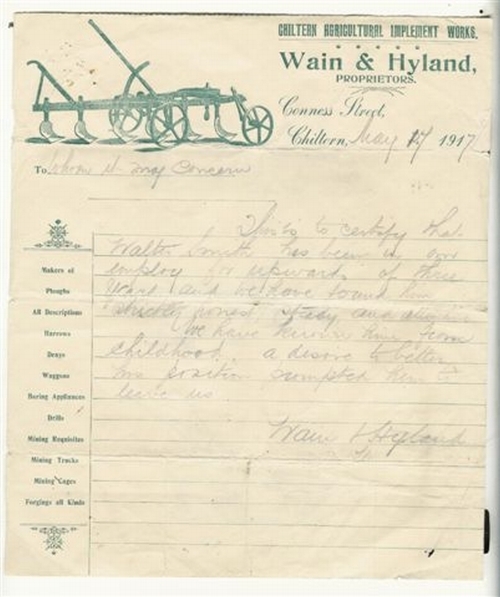 Wain & Hyland, Wain & Son a short Company History. One of Chiltern's oldest and most esteemed citizens, in the person of Thomas Wain, JP, died at his residence in Albert Road on Saturday night at about 11pm at the age of 80. Some two and a half years ago Mr Wain took a heart turn, but he recovered, only to have the turns recur at frequent intervals. Twelve months ago he developed another ailment, and a few weeks ago took to his bed to eventually sink into a state of coma and pass away peacefully. The deceased was the eldest son of the late Thomas and Jane Wain and was born in Beechworth. In 1862, at the age of three years he came to Chiltern with his parents, which was three years after the discovery of gold in the district. His father was then a carrier. Starting school at a private class, he later went to the state school, when the state education system came into vogue. This school was under the headmastership of the late T.S. Marshall. Upon leaving school he became apprenticed to the late James Moore, who had a thriving firm here in Chiltern in the early days. After serving his term as a blacksmith he went to Albury and was employed by the Lampitts, who had a foundry business, and it was he who made the spiked iron gates and fences at the courthouse and offices in Dean Street, Albury, as well as the iron gates at Mates old store in Townsend Street. Eventually he migrated to Sydney, where he was employed by Triggs and Mair, and while there received word that he could acquire the business of James Moore and Son, then in the hands of James Moor Jnr, at Conness Street, Chiltern. After putting the proposition to Mr John Hyland, who was also working in Sydney, the two young men entered into a partnership under the style of Wain and Hyland in the year 1884, and assumed control of the large business at which they had both worked as apprentices. Later the business took over the firm of the late D.J. Miller, wheelwright and coach builder. 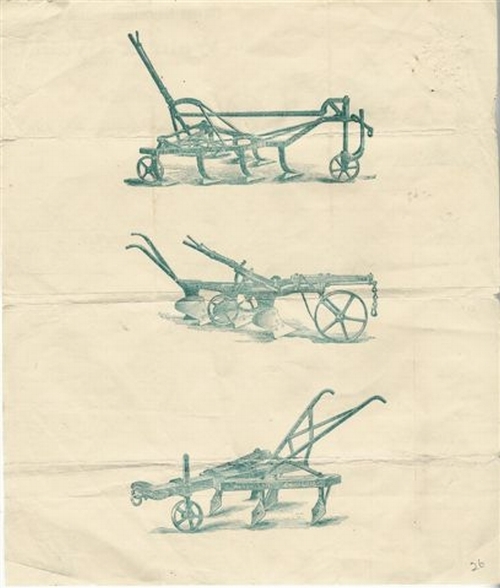 The firm flourished and became famous as the manufacturer of ploughs and vineyard implements, for which it won prizes in district shows. Mr Wain's services were greatly sought after, especially by mining companies, and eventually the firm manufactured machinery for the big mines when the industry was at its zenith in the district. The business was noted for its boring and had large contracts for putting down bores at the deep alluvial mines. The partnership continued until 1921, when Mr Hyland retired from it and Mr Wain took into partnership his son Leslie. Some years ago he purchased Chiltern Motor Works, which had been established by Mr King, and he took another of his sons, Alexander, an engineer, into the partnership. Eventually he disposed of that business to Faller and Bogetti. When a youth, Mr Wain was a member of the then-famous Chiltern Volunteer Fire Brigade, when it was at its height and under the captaincy of the late T.S. Marshall and H. Carter, and was a member of its many competing teams. He took a great interest in politics, and was an ardent free trader and an authority on rail freight anomalies, and could quote figures showing how the charges acted against country interests and industries. As a citizen, Mr Wain took a keen interest in everything promoting the welfare of Chiltern, but never sought public eminence, although at times he was induced to. He speculated, and was a shareholder in a number of mining companies, as well as a director of several cooperative ventures. He was a prominent member of the defunct Chiltern, Barnawartha and Indigo Agricultural Shows, and for many years had been a Justice of the Peace. The deceased, who had resided in Chiltern practically all of his life, was a clever and well-read man, conversant with local and world affairs, and had a large circle of friends, who always found him the best of company. His reminiscences of the early days of Chiltern were a highlight of entertainment. The late Mr Wain married at Beechworth to a daughter of the late James Lynch, who was a sergeant in charge of the Chiltern Police Station at the time of the Kelly Gang. Besides a sorrowing widow he leaves a family of eight children: six sons and two daughters. Elizabeth (Chiltern), Alexander (Melbourne), Richard (Newcastle), Leslie (Chiltern), Harold (Melbourne), Mary (Mrs Matthewson, Koromburra), Horace (Wagga), to mourn their loss. Another son, Thomas, the eldest, died many years ago. One of the deceased's sons, Leslie, served with the Australian forces in the Great War. The funeral moved from the residence on Saturday afternoon for the Chiltern New Cemetery, the cortege being a lengthy one, and showing the popularity of the departed, every part of the district being represented. The Rev J. Lawless (Roman Catholic) read the burial service. The casket was carried by four returned soldiers: Messrs I. Smith, R. Wiseman, P. Hitch and A. Cooper. The pall bearers were Crs C.D. Martin, shire president, and C.A. Oates, and Messrs E.A. Plastow, E. Bloom and R. Scott. Messrs Lefoe and Todd carried out the mortuary arrangements. Thomas was apprenticed as a blacksmith to the large business of James Moore in Chiltern. Later he moved to Albury, then Sydney, before returning to Chiltern to buy the Moore business in partnership with John Hyland on the retirement of James Moor. The business took over D.J. Muller's wheelwright and coach works, and later Chiltern Motor Works from Mr King in about 1926. After the retirement of John Hyland, Thomas Wain took his sons Leslie and Alexander into the business with him. He employed Bill Faller as a mechanic. Mr Wain sold the business in April or May 1930. The business then became known as Faller and Bogetti. Mr Faller retired about 1956 and died soon after. At the time the business closed, Kevin Wain, son of Leslie, was working for Mr Faller. 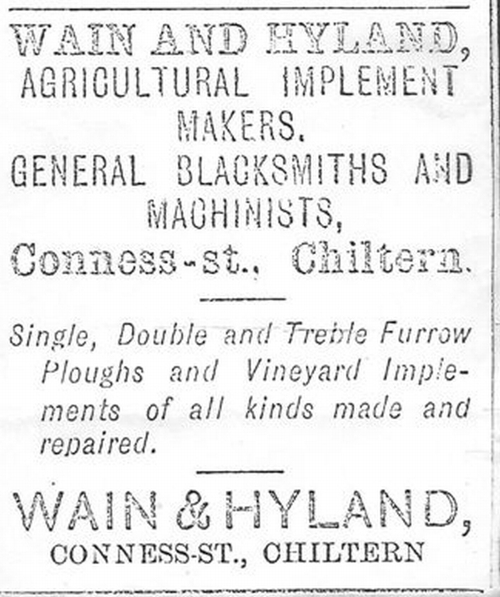 Hyland and Wain manufactured equipment for the mines in the region, as well as ploughs and other machinery. Thomas Wain was an expert at sinking bores. Source: Much of the Wain family history information is from a Wain family tree created by Eunice McGlynn and Beverley Wain around 1986. Thanks to the staff at the Athaeneum Museum in Chiltern in Victoria for sharing information and giving permission to use some of their material on this website. Wain & Hyland spanners and Wain & Son spanners are rare. To date only 3 examples have come to our attention - see all below. Above - Forged steel Buggy Spanner marked Wain & Hyland. (1884- 1921) © Chiltern Athaeneum Museum, used with permission.